1. Drain the syrup from the cherries into a small pan. Bring to the boil for 5 minutes until thickened, then add the brandy and simmer gently for a further 2 minutes. Leave to cool. 2. When ready to serve, crumble the brownies into the base of 4 sundae glasses. Drizzle over half the syrup then add the ice cream and the cherries. 3. Swirl a spoonful of cream onto the top of each and drizzle with cherry sauce. 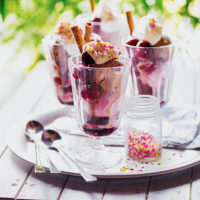 Serve with 2 wafers in each glass and sprinkles on top.